Mouse IDGenes serves as reference database for gene expression data and gentic interactions in the developing mouse brain. It is implemented to allow for permanent update and enhancement of the data. So far it covers developmental stages E8.5, E10.5 and E12.5. It contains mainly data about the developing midbrain. The tool intents to visualize the regional distinctions of geneexpressions in the mousebrain in an easy way. The anatomical area and the developmental stage for which information should be retrieved can be set by the user with the help of combo boxes. Mouse IDGenes was implemented as a relational database using PostgreSQL (http://www.postgresql.org). Gene expression and interaction data were manually extracted from literature and stored in the database including references. The database was made accessible online through a Java web interface, which was implemented using the Java Servlet class and runs on an Apache Tomcat Server. Mouse IDGenes uses a brain regionalization model, which covers developmental stages E8.5, E10.5 and E12.5. Our model is based upon literature (Sato and Joyner,2009; Caspary and Anderson, 2003; Echevarria et al., 2003; His, 1892; Jessel, 2000; Liu and Joyner, 2001; Martinez-Babera et al., 2001; Mason, 2007; Puelles and Rubenstein, 2003; Rubenstein et al. , 1998) and the MGI database (http://www.informatics.jax.org). The regionalization was kept as general as possible, but as exact as necessary. The regionalization model covers initially the anterior-posterior compartmentalization of the brain derived from the brain vesicles. Within these vesicles we further divided the regions on the anterior-posterior axis as well as on the longitudinal axis into lateral and medial parts. Therefore, we developed a tripartition of a respective brain region, which has the general structure of vesicle - > anterior-posterior localization - > medial-lateral localization. Whenever no further division could be made the description all was used. For the conversion of the developed brain model into the EMAP ( http://emouseatlas.org) and EMAPA classification (ftp://ftp.hgu.mrc.ac.uk/pub/MouseAtlas/Anatomy/EMAP-EMAPA.txt) we kindly ask the user to refer to the convergence given in our publication (). Home: The start page of Mouse IDGenes. It can be accessed via the URL: http://mouseidgenes.helmholtz-muenchen.de. 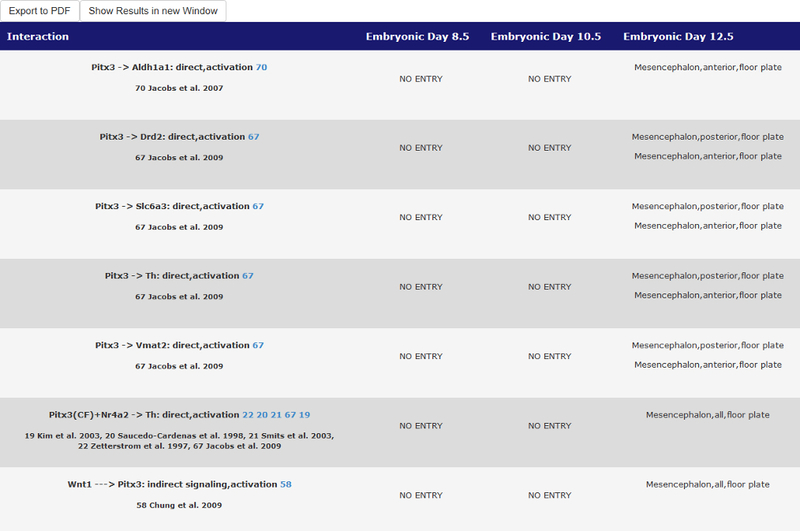 Apart of being able to navigate through the page there is general information about Mouse IDGenes displayed. Detailed Search: The user can request gene expression as well as interaction data from Mouse IDGenes in specific brain regions of the embryonic brain at developmental stages E8.5, E10.5 and E12.5 with the help of combo boxes. Search for Interactions: Mouse IDGenes webpage allows the user to search for specific interactions between two genes of interest and for all interactions in which one specific gene of interest is involved (by the "Search for specific interactions" button). By selecting "all" in either both or only one of the gene selection boxes the user can search for all stored interactions either of the whole database or in which a specific gene of interest is involved. direct: We define a direct interaction in case interaction partner 1 binds directly to the promoter of interaction partner 2.
direct signaling: In case of a ligand that activates a signaling cascade or any other component of a signaling cascade that does not directly interact with (or binds to) the promoter of a target gene of this signaling pathway, a direct signaling interaction refers to the activation / repression of a direct target gene of this signaling pathway. indirect: Interaction partner 1 does not bind directly to the promoter of interaction partner 2, and signaling or genetic interaction cascades have to occur between the two interaction partners. indirect signaling: In case of a ligand that activates a signaling cascade or any other component of a signaling cascade that does not directly interact with (or binds to) the promoter of a target gene of this signaling pathway, an indirect signaling interaction refers to the activation / repression of an indirect target gene by a direct target gene of this signaling pathway. maintenance: Interaction partner 1 is not required to activate (i.e. turn on) or to repress (i.e. turn off) the promoter (or expression) of interaction partner 2, but to keep this promoter (or expression) activated (on) or repressed (off) over (a longer period of) time. IEXP: Inferred from experiment (e.g. loss of function/gain of function) and/or expression pattern. The following general interaction schemes can be found in or be input into the database: direct activation,direct signaling activation, maintenance activation, IEXP activation, indirect activation, indirect signaling activation, direct repression, direct signaling repression, maintenance repression, IEXP repression, indirect repression and indirect signaling repression. The symbols used for these interactions on the Mouse IDGenes webpage are depicted as follows. Data Input: This tab allows the user to input new data to the database. Mailinglist: By navigating to this tab, the user can subscribe to a mailinglist in order to discuss the contents of Mouse IDGenes with other subscribers of the mailinglist. Contact: The Contact tab lists the responsible persons for the implementation of Mouse IDGenes as well as for biological issues. Help: This page offers instructions how to use the database and offers solutions for frequently appearing problems. Download: This tab enables the user to download a flatfile with the entire data stored in the database. The output of a specific search either in one of the gene expression or the interaction menu items appears on the same page underneath the user selection. It is organized in a table like format. In case of the gene expression data (radio button: "display genes according to the chosen region") the output table indicates the developmental stage the user is looking at. The output further shows the deeper regionalization of the chosen anatomical area and which genes are expressed there. 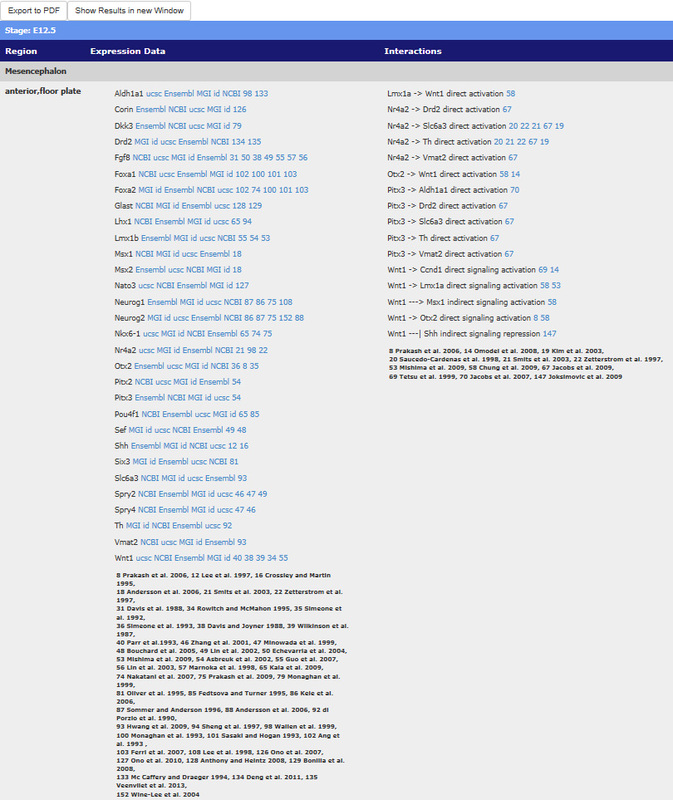 It additionally displays the links to the public databases NCBI, MGI, UCSC and Ensembl, where additional general information about a displayed gene can be retrieved. Most importantly also the literature for each entry is indicated from which the displayed gene expression information was retrieved. 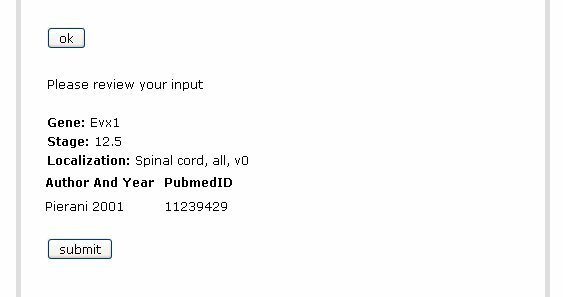 The last column "Interaction" of the output shows the interaction data, which can be retrieved for the actual CNS region at the actual developmental stage with the corresponding literature references. Currently the database contains 89 expression datasets and 145 genetic interactions. Genetic interactions as well as expression datasets are assigned to different anatomical regions at the stages E8.5, E10.5 and E12.5 of mouse embryonic development. The data is highly curated. It was manually extracted from literature and stored in the database using references. 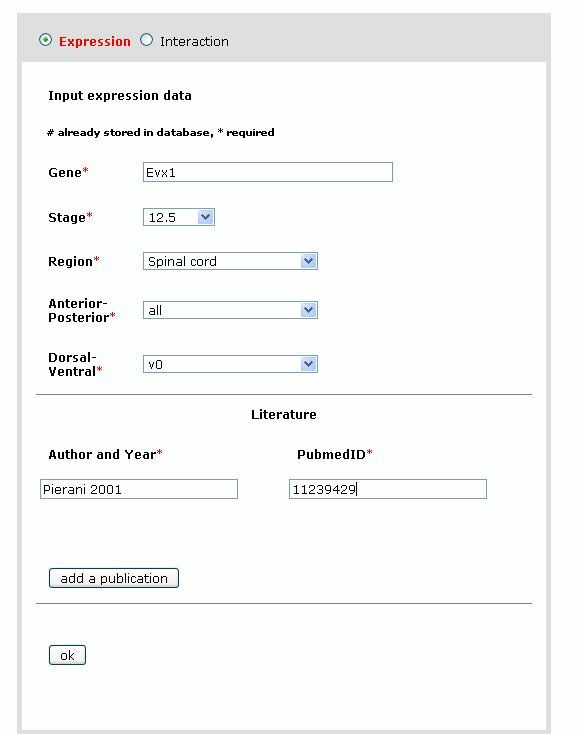 The database includes only citations of gene expression patterns in the mouse embryo. Genetic interactions refer only to those validated in the mouse embryo. However, citations of gene interactions include literature from other species (e.g. chicken) if the gene interactions in this species are the same as in the mouse embryo. The user is able to save/download obtained search results in a PDF file, by pressing the button "Export to PDF", which appears on top of every search result. Additionally a flatfile of the information stored in the database can be downloaded by navigating to the Download tab. To input new data the user is asked to maintain the overall CNS regionalization scheme, by storing data with the help of combo boxes, which follow the established CNS model (see What brain regionalization model was used). 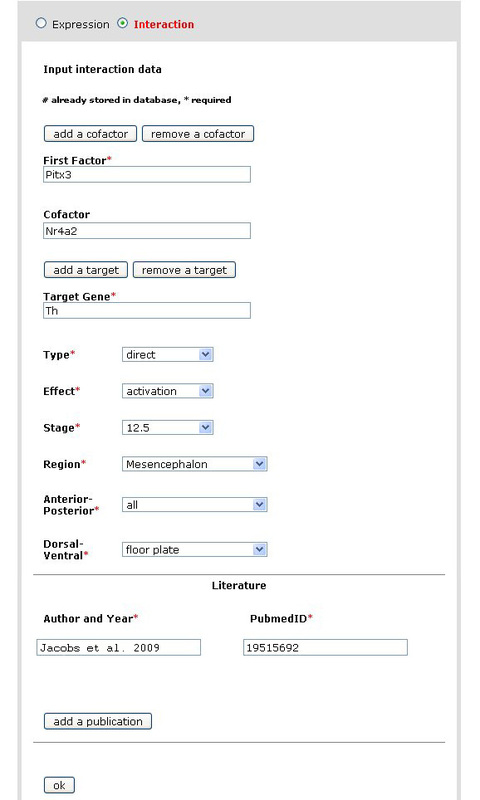 In order to maintain the high degree of curation in the current database it is necessary to also introduce the corresponding literature as well as the corresponding PubMed ID. Users can input gene expression data as well as interaction data into the database by selecting the respective type of data on the webpage. In case of extending the database for an interaction it is possible to input also cofactors and more targets of an interaction. After completion of the dataset the user is asked to review the input before final submission to the database. Data, which is not validated, appears on the webpage with a note saying that the data is not validated yet. The data is validated by manually checking the corresponding literature, which was given with the data input. When being positively validated, data will appear without the "not yet validated" note. The data is validated by Dr. Nilima Prakash. She is an independent group leader at the Institute for Developmental Genetics (IDG) at the Helmholtz Zentrum München. Her field of expertise is the development of the mid-/hinbrain boundary (Institute's webpage). In order to subscribe to our mailinglist, users can navigate to the Mailinglist tab and fill in the shown form. The mailing list is used for communication between subscribers about data in the database or the database as such. It therefore is a tool, which migh also facilitate the validation of new data. The developers and researchers responsible for Mouse IDGenes can be contacted via E-mail (see Contact tab). If the data stored in our database is useful and you use it for publications, theses etc, please cite: Matthes, M.†, Preusse, M.†, Zhang, J.†, Schechter, J., Mayer, D., Lentes, L., Prakash, N., Wurst, W., Trümbach, D. (2014) Mouse IDGenes: A reference database for genetic interactions in the developing mouse brain. Database (Oxford) 2014; doi: 10.1093/database/bau083.